Wim T. Schippers is a household name when it comes to highly original, slightly disruptive visual art, television, and theater (besides voicing a number of Sesame Street characters). With his 73 years, he is sprightly as he gives an energetic performance in the range of scenes that make up Hoogwater Voorheen Laagwater. 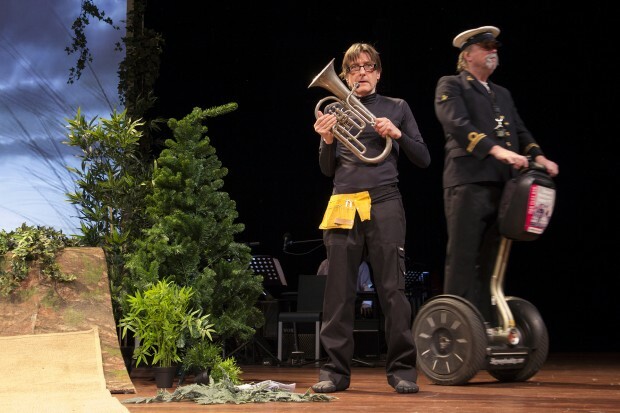 Nearly two hours of constant surprise, the show derives its humor from the fact that the actual show cannot go on due to all sorts of interruptions and unforeseen circumstances, such as Schippers fainting or a guard entering on a Segway to check up on things. Meral Polat kicks off, singing a wonderful solo and tending to Schippers as he falls over on stage. A very funny Joep van der Geest, who claims he was supposed to host the show, arrives late but relentlessly defends his position as he attempts to take control over the situation. Four musicians, who double as actors, provide the score to this absurd world. After watching this piece of theater and, specifically, enjoying its clever treatment of our use of everyday Dutch, you feel as if your brain is rewired. Everything is slightly off – the bit where Schippers plays the piano is too long, whereas some of the material isn’t given much space at all, so that the audience pays close attention all along. The most unsettling moment – and I still don’t know whether it was part of the show or not – was when a woman in the audience began hissing whether anyone brought tomatoes (she didn’t like the show). I can’t figure it out, but it does seem to be in line with the chaotic nature of the piece. ‘Hoogwater‘ might be dreadful for those who can’t deal with annoying linguistic quips and who don’t like to enter into a singing contest with the onstage choir (a different one every place the show travels to). But if you open up to Schippers’ crazy brilliance, you could have a heck of a time.